I didn't think much of the health check, except that there were certain things that were a little different this year. The stool sample was also collected last year but they did not provide the "soluble paper" then. There was also some additional tests, some were compulsory, some optional for a fee. One of the compulsory ones this time was the barium test. I've never heard anyone having to go through it, so didn't think much when I went for my health check, assuming it was just like any other tests. There was a short paragraph in the explanation sheet provided by HR (they had to translate from the original given by the clinic). Sure enough, it was as stated - drink some thick white liquid, and get your x-ray done to check the linings of your stomach and intestines. What I didn't expect was the awful feeling of gulping down the chalk-like substance, and having told not to burp. It's as if someone had pounded blackboard chalk into a lassi texture. It was rather tasteless, and gave my stomach a bloated feeling. If it was vanilla flavoured maybe it could have been more palatable. What I expected was to stand still and have the machine send x-ray particles through the body, and I'm done. So I was a little surprised at having to lie down on a large metal plate, holding on to the side rails while the machine tilt me to various angles. There's even one angle which reminded me of being on a roller coaster going downhill. All these while very conscious of the white blob moving about inside my body. 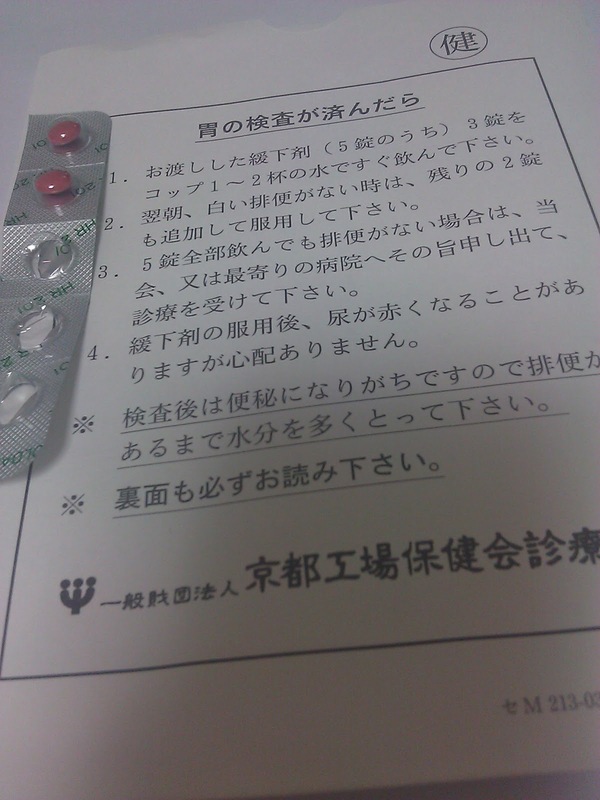 After completing the other tests, the nurse gave me some laxative tablets. I was advised to take 3 pills first. If it still didn't come out, to take the remaining 2. I happily went for lunch after the tests, thinking that was the end of it. Now, I also don't know anyone who has taken laxatives nor heard of experiences other than "it makes you poop out everything you've eaten" from articles on anorexic grrls. All I can say is I'm glad I live nearby, and I didn't "let go" while on the train going back. Just as I stepped into my room, it almost immediately came out. I will spare you the details, but suffice to say, that experience was worse than the whole barium test itself! It's like having diarrhoea for nothing. Don't ask me what the colour of the poop was, all I wanted to know was how long my misery would last. When I recalled my ordeal to my Japanese colleague the next day, she said she wished she had gotten the opportunity for the test. (She's a contractor, so is not entitled for similar tests as other employees.) I told her, I'd gladly forfeit mine and ask her to take my portion! Apparently, this is a common test during health check up in Japan. 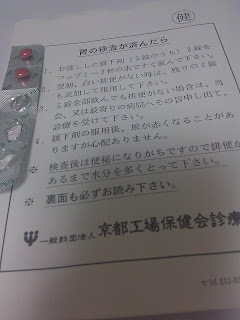 I later found out that stomach cancer is one of the top 10 causes of death in Japan.